When Barry Turner decided to give his living room a dramatic new look with new furniture and an elegant black and silver colour scheme he knew that his old Burley electric fire would have to go. Read more here. Is the Dimplex Castillo available with coal effect rather than white pebbles? The Castillo is only available with pebbles. We bought one of these fires 10ish years ago, it had to go due to general wear and tear. We had no hesitation in ordering another one it’s a lovely fire great flame effect and on the rare occasion that we have use the fan heater it does the job. The price was really good we could not find it as cheap anywhere. 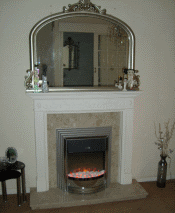 We would not hesitate in using gr8 fires again , delivery was excellent and on time. Unfortunately the fire was rather plastic and developed a fault after only a few days - However GR8 were excellent, they arranged collection of the faulty fire quickly and a prompt refund without question as a replacement or suitable alternative was not immediately available. I would recommend this retailer without question. Love this fire. Its stylish and classy and with a re4ally affordable price. The flame effect is so real my grandson went to warm his hands on the flames thinking it was a real fire. Execellent service and product. Swift delivery. Very happy with our purchase. Thank you. 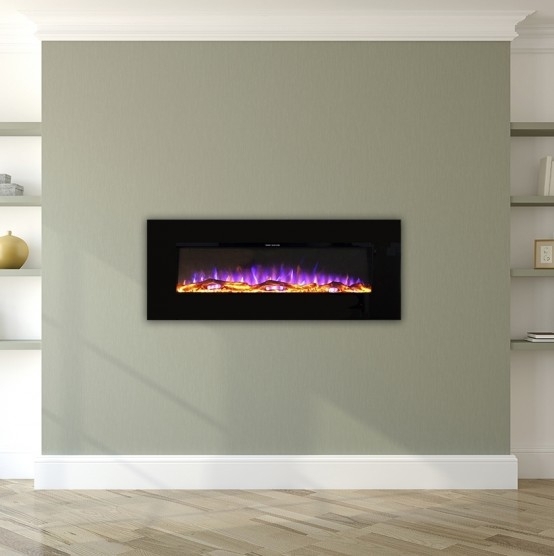 Fire was great price and looks fab. Delivery spot on too . Love the fire. Like that you can have coals in winter and exchange for white rocks in summer. The fire is just what I wanted. The only downside is that it's a little noisy. I think it's reasonably priced. It looks good in my living room. This fire looks lovely. A previous review mentioned the "plastic" appearance of the surround and I must agree that, at first glance, it did have that appearance but now it's in place it does look pretty good. The white coals look great and the glow setting is very calming and I will probably use this on dark winter evenings. To be able to just plug it in and push it into place is also a good feature and it does fit nice and closely against the back of the fire place. I'm delighted with this purchase. The delivery time was excellent and I was kept informed all the way up to delivery. I have purposefully waited a few months before leaving any feedback for this for fire but I need’nt have. We are really, really pleased with the complete package from placement of order to it’s fulfilment. The fire itself is a lovely centre piece of our lounge and gives a lovely ambiance both with the coals and with the return of sunny days I have swapped the coals for the white pebbles which equally looks just as great. Bothfriends and family keep remarking on the beauty of it. Delivery very fast and was best price in comparison to others. Flame effect is very good and massive improvement on my last fire. I would say the flame effect matches ones of much higher spec/price fires I viewed in local showroom. The only negatives for me are 1) the silver surround is a little 'plasticky' looking but it's growing on me 2) black wire sticks out like a sore thumb so will be spraying with white plastikote spray in due course. Was chuffed to bits with this fire. Came earlier than I expected and instantly changed the room. Didn't realise it came with stones as well as coals to change the look so that was a pleasant surprise. Even just the light gives an impression of being warmer so have hardly had to put the blower on. Thanks for great a service. Lovely looking fire. Great service. Never purchased from you before, therefore slight apprehension. Shouldn't have worried, very pleased with the product, price and delivery. Would certainly buy again and recommend without hesitation. Well done. The fire i ordered is exactly what we needed, it looks good, love the fire effect on its own, instant heat, easy to clean & the cat likes it. Enough said. After searching the internet to find what i wanted i made a phone call to GR8 fires for further information, they were so helpful i ordered the fire i had been looking at from them right away. The fire arrived sooner than i expected, " the reason " the whole of the UK was covered in snow. Well done gr8fires. Looks lovely and cosy in my living room. GR8 had by far the best price for this fire on the internet. The phone borderline was simple to use, the courier delivery was very speedy and the fire arrived in pristine condition and looks great. No hesitation in recommending GR8! Lovely fire and perfect size and price. I only use it for show and always have the glow on in the evening for an effect but it's so realistic that the dog lays infront of it thinking it's real! Only taken out of packaging to use later but very pleased with the appearance of it. Should look good against wall when room decorated. Planning to stand it on grey slate hearth. Nice to have choice of pebbles for Summer and the coals for Winter. Delivery very quick and it was cheaper to buy here than other Suppliers. 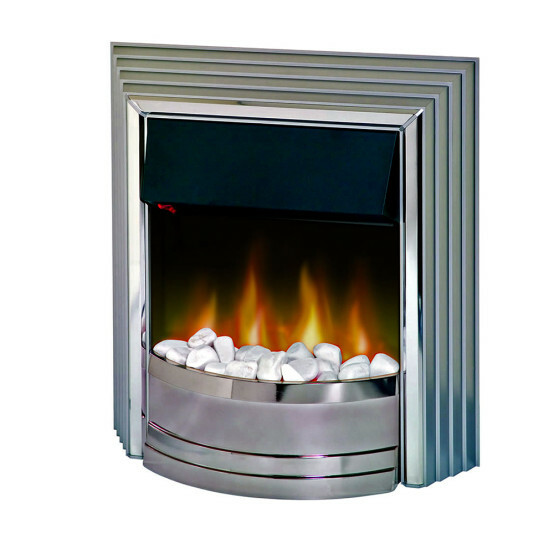 Recommend fire and supplier..
Lovely fire, easy to install looks very effective. Very pleased. A great firm to do business with others who have seen the fire are very envious and want one. Would buy from this firm again. I highly recommend them. We've had a coal fire for many years, but recently this has become difficult. We debated for some time, remembering the old style electric fires which bore little resemblance to a real fire. How delighted we were that we finally decided to purchase this particular product. Simple to install, quiet in operation and it looks fabulous in our traditional room setting. This is a lovely looking electric fire and I use the white 'coals' rather than the black, both of which were supplied. Gives the required heat you would expect from a 2 kw fire. Delivery was great. I am happy with this purchase. The heat is amazing and only use the 1kw. Easy to install. Excellent value for money. Fast delivery. very pleased thank you. It is very rare for me to give 5stars in a review as I always feel there is room for improvement but not in this case. The fire is really lovely everyone remarks on it. Price much cheaper than other I had looked at, delivery quick and on time . I would have no hesitation in recommending this company and my FIRE. thank you. Bought for a rental property, the price seemed good. Did not expect it to look so good once installed. Seems flimsy and rather cheap looking when taken out of the box, but don't be put off once installed it looks very good. My tenant was beyond pleased and so was i. Excellent product. I love the fire I purchased and the service & delivery I received from gr8fires was second to none. I have recommended to my friends and will definitely use again. I m extremely pleased with the fire. It looks beautiful and even with just the light turned on is very cheery. It arrived promptly and was well packaged. Purchased for decorative purposes and not for use other than the light. Most impressed also have the choice of using stones or coals. We opted for stones (could do with a few more). Really pleased would recommend. 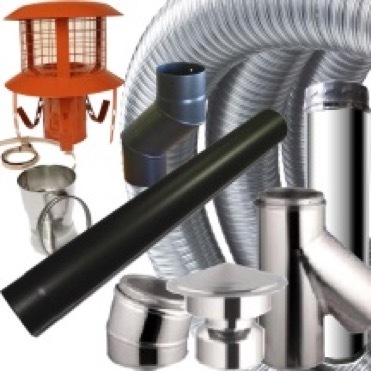 Excellent service,item came well packaged,good value,would use this seller again. very happy with fire will recommend g8 fires to frends. Considering the price this fire is very good value, easy to install and very realistic flames. It makes a lovely focal point and makes the room look cosy . Good price, but not suitable, therefore returned. Love the fire. So realistic & warm. Looks beautiful too. Easy to use website led us to the ideal fire for our granite and slate fireplace. The fire is very good and does the job very well. The service was very good and delivery was excellent. Thank you for all your help. Fire as described, good value. Looks very effective and cosy. Delivery good. Would recommend this company and product. This is a stylish looking fire. It requires no assembly so is simply placed in position. The delivery was prompt. My only complaint about the fire, is that the switch is not easily accessible as it is under the hood, and not visible unless you bend down low. Therefore you have to change the heat setting by touch only. Fabulous looking fire. Really sets the whole room off. And what's more, sends out great warming heat. couldn't ask for more than all that. delighted with the fire but a little disappointed with the surround material. However, the overall effect is very acceptable. Delighted with the fire but a little disappointed with the surround material but the overall effect is very acceptable. We are very pleased with our fire, we wanted it primarily for the flame effect and this is very realistic.. The price was really good and the delivery was prompt and efficient. Absolutely love the fire it has a beautiful glow and gr8fires delivered very quickly. Would recommend the company and the fire to everyone. A very attractive electric fire and the heat is very good. The coal effect is excellent and makes the room cosy. Very pleased with my fire,looks good and flame effect very pleasing. The service and delivery was excellent would highly recommend gr8fires to friends and family. Really pleased with the fire, looks great on the hearth. Delivery was as promised. Would recommend the company to all. Great looking fire at a good price, not really had the chance to use it yet with it being summer but it has made the living room look good and the flame effect alone makes it look cozy, also, a very good service by Gr8 fires. Love the oriflame effect on this fire .looks amazing with just the glow light on .looks exactly as in the picture .I am very HAPPY and would recommend it . from the moment of order to delivery everything was fantastic! everyone comments about the fire and I would defiantly buy from gr8fires again!!! Got the fire for my dad. He is delighted with it. It looks lovely in his fireplace and the flame looks amazing. Safer than his gas fire too! Excellent service very happy with my lovely -better than I expected. Overall very pleased with fire. Ordering brilliant and delivery received when they said they would. I certainly would not pay £220 and I think that even on offer at £149.99 is still expensive as the surround is very plastic, but I guess you are paying for the name, perhaps? Superb item,superb service comes highly recommended. exellent outstanding value for your money, well happy. I love the fire, it's beautiful. This company delivered very promptly. Best price for this lovely free standing fire. Looks good with realistic flame effect and makes room nice and cosy even without heat. Excellent service. Very attractive fire I am really pleased with my purchase. I will recommend this company to my friends. Absolutely delighted, the flame effect is so realistic and the fire fits in so well with our black and silver decor. The price was a lot cheaper than elsewhere and delivery was as promised. The white pebbles provide a stunning effect, much better and less messier than coal. One small point to the manufacturers - I would have preferred a white mains cable and the black one supplied was also too short for my requirements but I bought a white cable 3 metres long and everything is now alright. first class product,flame effect very realistic,excellent price and delivery. 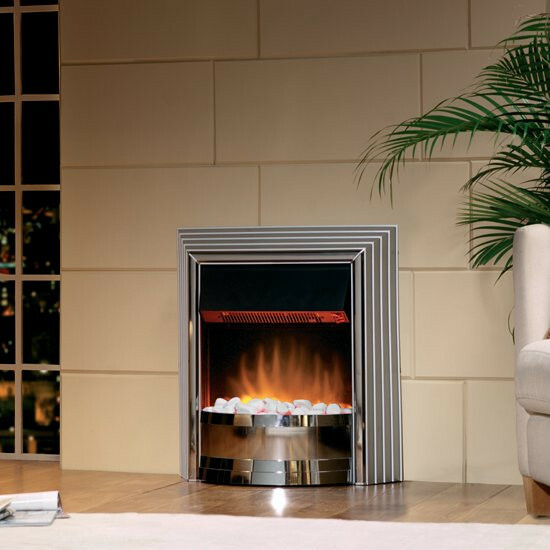 The Dimplex Castillo freestanding electric fire complemented the decor in our lounge perfectly. Beautiful looking fire at a very reasonable cost. have just received our castillo electric fire, ordered it late wednesday delivered first thing monday morning. fire is beautiful very realistic flame effect, looks lovely with the coals in. 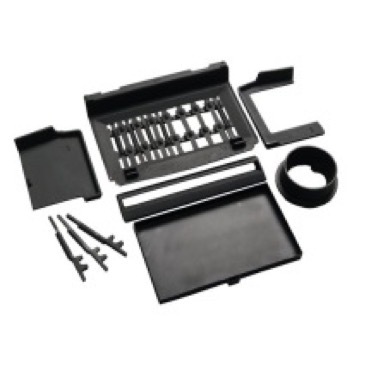 best price i've found for this product, and very quick and easy to order. The fire is very attractive, the flame appearance is very real and warms the atmosphere of a room. It also heats up well and not too noisy, any fan will make some noise. Gr8 Fires is a fantastic company. I ordered the fire on Saturday and it was delivered on Wednesday and communication excellent throughout, keeping me up to date on delivery. It was also significantly cheaper for the exactly the same fire from other retailers. I would definitely buy from this company again. Just had to write to say how delighted I am with this fire, looks a lot more expensive, the glow effect is fantastic, has completely transformed my fireplace, how can you possible charge such amazing prices for amazing fires, thanks. ANn. Very pleased with this fire, have been looking for ages. Good price. Looks smart and modern. By just turning on the light effect you feel warmer. Really pleased with the fire. Looks lovely and is great value for money. Was delivered well within 48hours. Thanks for being so helpful. We are very pleased with the fire and the price was excellent compared to other sites, the fire arrived well within the 48 hour delivery, thanks for all your help.